If the root of maker culture is curiosity, then curiosity is the basic thread running through her life, said Fimbel (right, with Sonya Stephens), a retired college professor and administrator. "I hope the Fimbel Lab will inspire others to be continuously curious," she said. "To give students even more tools than they've had before. To enable them to feel the joy of making something. Making an idea become tangible. Solving a problem however small. Mastering the world they live in." The College's new Maker Space is named after Nancie L. Fimbel '68, who made a $1 million anchor donation for the $3.5 million lab. With heavy hearts, we report the passing of Nancy Fletcher's husband, David Shepherd, the improv genius who urged us all to be creative. Since our 40th MHC Reunion, our group of 6 classmates has been getting together with our spouses for a mini-reunion once a year for a weekend at one of our houses, from Cape Cod to CT, NYC and Northern Virginia. This fall we gathered at Mobby & Dave Larson's home in Gales Ferry, CT. Five of us met Thursday night at the Florence Griswold Museum where Judy Hayes was honored for her gift of family heirloom watercolors painted by Fidelia Bridges. Connie Cushman joined us for the rest of the weekend during which we shared meals, memories, a hike through Gungywamp Swamp, and lots of conversation! Four of us roomed together freshman year in Buckland; all six of us were dorm-mates junior & senior years. October 15, an impromptu mini-reunion in Alexandria, VA: Susan Clark Iverson, Liz Tannenbaum from Brattleboro, VT, Anne Wood Hanley from Fairbanks, AK, and Claire Whipple Stech. 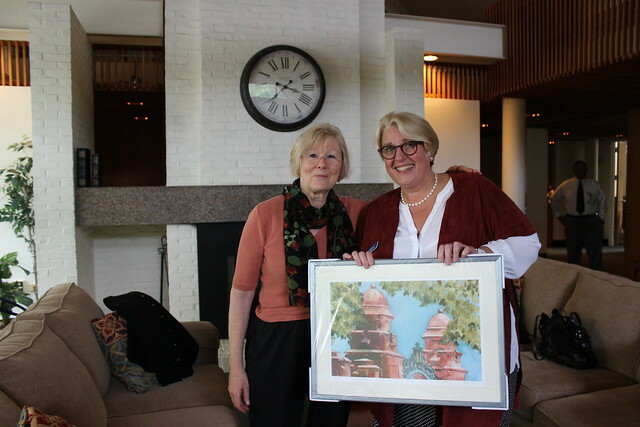 President Sonya Stephens Receiving Toni Eisenhower's Painting from Class President Nancie Fimbel, Sept. 28, 2018. Please forgive the delay in writing to express my heartfelt thanks to you and your class mates for the generous and thoughtful gift to mark the occasion of my inauguration. I was so moved to receive Toni Eisenhauer's painting of Mount Holyoke, and want you all to know that this is now hanging in the President's House where all can enjoy and admire it. It looks just perfect against the deep blue of the wall and is in the sightline of the Field Gate. If only one could see through walls! 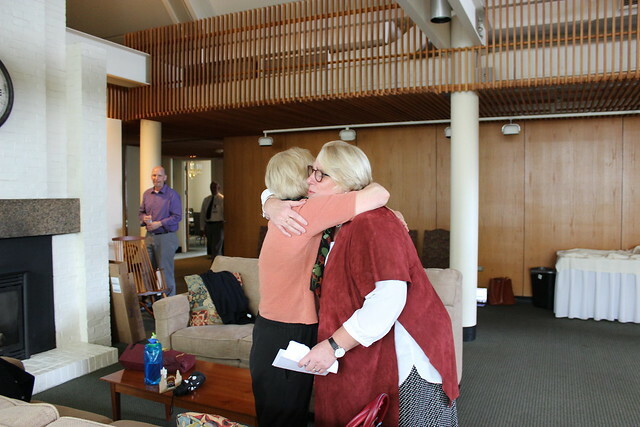 Thank you for this lovely gift that honors Toni's work, your class, and Mount Holyoke. I shall always treasure it, and hope to be able to thank the members of the Class of '68 wherever I see them. Renewing friendships. Discovering new relationships. Testing memories of beloved places against their actual states of being. Walking in the shoes of who we were 50 years ago. Learning what some of our classmates have made of those 50 years. Marveling at what a great party our classmates could throw to celebrate this anniversary. It was a weekend! 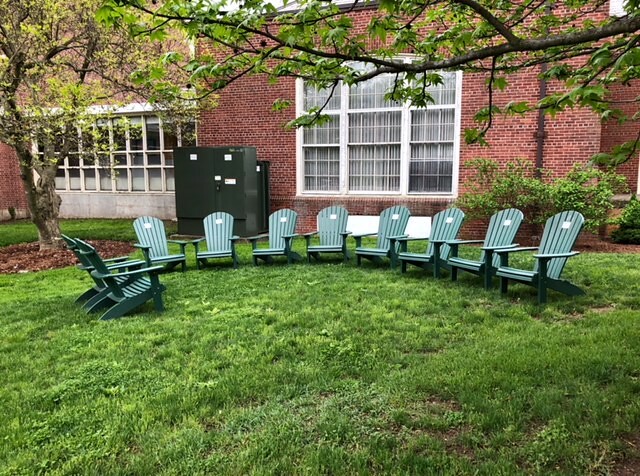 To help you to savor our 50th Reunion just a little longer--or help you envision it if you missed it--go to our Class Website at http://www.mhc1968.com for pictures. I'll add more over time if you send them to me at fimbeln@gmail.com. On our Website you will also find the list of our class award winners. 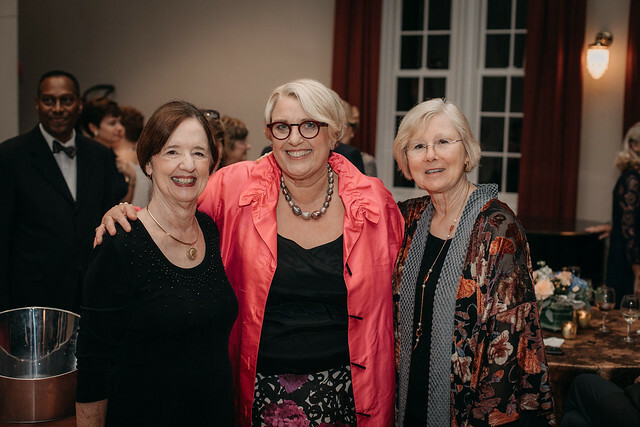 Susan Rieger was presented with the Alumnae Achievement Award and Elizabeth (Liz) Tannenbaum was awarded the Elizabeth Topham Kennan Award. Both of these are given to women who have achieved outstanding accomplishments in their lives. Congratulations to both on this recognition! Honored, too, were those who have voluntarily served Mt. Holyoke especially generously. Loyalty Awards were presented to Paula Braga Leidich, Carolyn E. Dorais, Susan Graham Simpson, and Karen Kelly Taggart. Thank you for your devotion to our Alma Mater! Attached here are a couple of documents you might find fun: a list of children's books, compiled at reunion, that we loved, and the Commencement speech that David Riesman gave when we graduated. You will recall that Riesman was a noted sociologist, co-author of The Lonely Crowd (1950) and The Academic Revolution (1968). Maybe more important is the third attachment, an invitation from Leslie Fields, MHC's Head of Archives and Special Collections, for us to contribute to the Archives. The College is sponsoring a summer internship project on the history of student activism on campus. Oral histories from us are being sought. Leslie would also like to learn about A Better Chance in which some of us participated. Our Memories Room impressed Leslie and she wants us to know what to save for MHC when we are ready to downsize. The attachment includes a list. Leslie also seeks volunteers (working from home) who are interested in transcribing letters written in cursive to add to the college's digital collection. Huge thanks to Nancy Huttemeyer Davis, one of the Co-Chairs for our 55th Reunion, who tracked down this information. It will be on our Website in case you misplace this email. One more time: Linda Renasco Cadigan and Debbie Dunn Rottenberg, you made it happen for us, and we applaud you! It is with a heavy heart that we inform you of the death of our classmate Martha Jane Bradford on March 21, 2018. Susan Rieger's book The Heirs is in the New York Times Book Review section. It is one of the six new paperbacks named in Paperback Row. 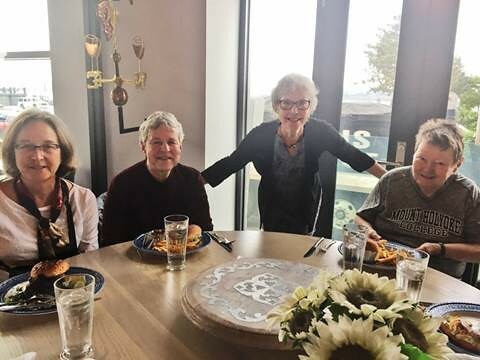 Eileen Sypher, Jody Hall Cale and Ann Knight got together in Early November at Jody's miraculously intact Santa Rosa CA home (Jody's spouse Ed and Eileen's John hung out part of the time). We had such a great time we hope to repeat it regularly! Eileen had a hard lesson though: she is no longer 20. Her shoulder met an unforgiving slab in Jody's living room. Healing, and it is hoped more wisdom, promised by reunion. Here are pictures of Penny Schneider Calf's induction ceremony to the National Field Hockey Coaches Association - Hall of Fame. (Top) Penny is at head table with her friends and four former students who are now coaches, following her example. 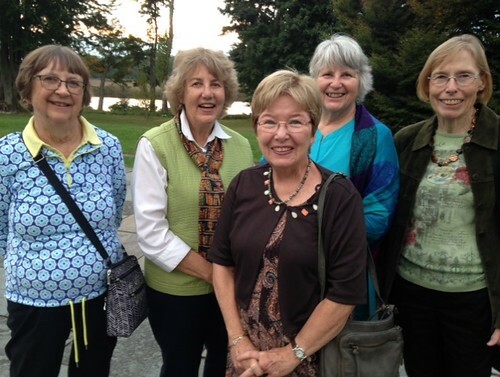 (Middle) Penny is with her Hilton Head friends (left to right) Rica, Suki, Penny, and Melissa, a special golf foursome. (Lower right) Penny is accepting her award. (Lower left) Her Mount Holyoke roommate, Class President Paula Braga Leidich, applauds. This is my first time submitting for the Quarterly. In 2011 I founded the Middle Passage Ceremonies and Port Markers Project (MPCPMP) with the mission of encouraging ancestral remembrance ceremonies and historic marker installations at the 50 documented Middle Passage arrival locations in the United States. These sites range from Maine to Texas and cover a period of more than 350 years (1526-1860) where captive Africans were enslaved after crossing the Atlantic. The Project honors the 2 million who died during the ocean voyage known as the Middle Passage and the 500,000 who disembarked on the North American mainland. Each place marks the beginning of a critical phase of American society influenced by Africans. Unknown and forgotten for the most part, these enslaved people and their descendants contributed greatly to the creation of this nation's culture, economy and overall development with little commemoration or acknowledgement. 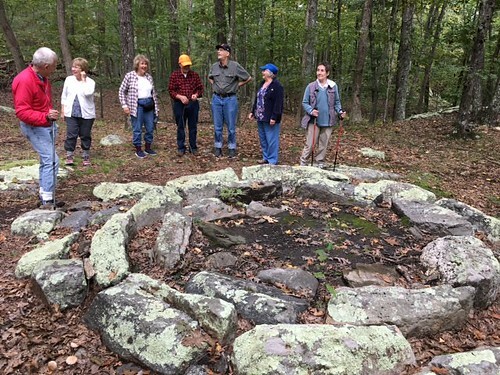 To date, ceremonies and markers have been completed at 25 of the 50 with approximately 8 marker installations pending for 2018. We are a team of 5 on the Executive Board and have divided the country into regions. For most arrival sites we form a state committee that does the historical research, determines the marker text, location, and design. We try to make it as broad a representation of the community as possible (academics, activists, churches, schools, Native American representatives, etc.). It usually takes from 12-18 months from beginning to end. Connecticut has two arrival sites: New London and Middletown, and it has been a challenge to get off the ground after two years of trying. We simply keep on pushing until something clicks. I have applied for a 2018 MHC Fellowship to support this important work. © 2019 MHC Class of 1968. All Rights Reserved.